With a prominent College of Art and a resurgence of artistic makers and doers, doesn’t it seem slightly odd that we don’t have something bringing all of these fantastic artists together and celebrating how culturally brilliant Leeds is? YES say beautiful gift and homewares store The Juju Shop! So they’ve put something rather special together to celebrate their first birthday. Taking over the basement at The Corn Exchange next weekend, this Showcase Spectacular is bringing together around 200 artists in all their forms in a cornucopia of cultural excitement. These guys have got everything: independent stalls from makers, live performance art, workshops, a mini cinema… a bar. It’s about time! The Juju Shop is a creative retail hub, supporting a truly surreal and quirky product range. The unusual is usual to our shop! It is our one year anniversary, so we would like to celebrate this, but what we also wish to celebrate is the huge amount of fantastic spaces and individuals all around us shaping Leeds’ truly unique cultural demographic. 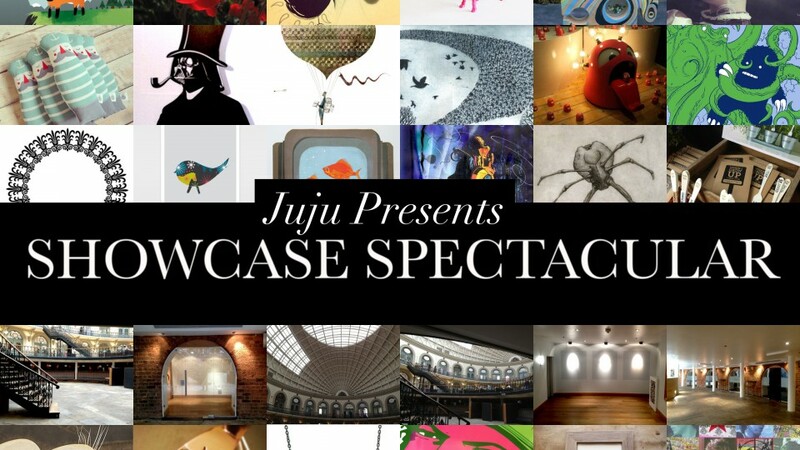 The Juju Showcase Spectacular Weekend is going to be an extravaganza of all things creative. It is taking place on the ground floor of the beautiful Corn Exchange on 16 and 17 November. Within the event there will be a host of pop up galleries, artists showcases, independent stalls, live performance art, student exhibitions, live busking music, practical workshops, films, bar, food, and a few more surprises. It will be a large slice of the cake of creativity all under one roof. We think this is really a huge combination of all the amazing arty and creative things going on in Leeds. There are charities, national collections, up and coming artists… you name it, we’ve got it! And it’s all completely free to come and browse around. Yes! We have a mega list of people you can see at the event. It’s going to be taking up the whole basement floor of the Corn Exchange! Leeds Gallery ~ Tony Baker and The Gallery (at Flannels) ~ Dominic Heffer + Guests, (Hull) ~ Sean Williams + Guests (Sheffield) ~ The White Room Gallery with guest artists Tom Lewis and Horace Panter (Leamington Spa & Bath) ~ East Street Arts ~ Dots Printhaus ~ Woolgather ~ The Tetley ~ Juju ~ Enjoy ~ Leeds Met University ~ Leeds College of Art & Design ~ Leeds City College ~ Sela Bar & That Sela Art Thing ~ Raise & Give Society. We don’t know! Look, the idea is that it’s for everyone and we’re only charging a little fee to stallholders. There are no commissions, no entry fees. We’re not going to say no to someone. It’s a celebration of the great scene we have in Leeds, so we just knew we had to get people who wanted to be involved in there. This showcase celebrates the ever growing cultural scene we are a part of. The goal of Juju is to assist creative makers in their journey to have a fully sustainable creative lifestyle, and to help bring great work to the masses. This is a celebration of a whole cultural scene that Leeds is very excitingly seeing growing at a huge rate every day.